David J. Carol’s new book, NO PLAN B, from publisher Peanut Press, is a retrospective of his uniquely humorous and often surreal personal work from the 1990s to the present. The book is a culmination of images from David’s “road trips” from the Arctic Ocean to post-Soviet Russia, from the Mojave Desert to the streets of Istanbul. Consisting of 32 black and white photographs, with an afterward by renowned photojournalist Jason Eskenazi, NO PLAN B is available in two bindings; the “black” trade edition, and a “white” limited edition, which includes a gelatin silver print signed and numbered by the artist. NO PLAN B is available for sale online at Peanut Press. 40 Miles of Bad Road is a ten year retrospective of David Carol’s personal work from 1993 through 2003 with an afterward by Anne Wilkes Tucker, photography curator at the Museum of Fine Arts, Houston. 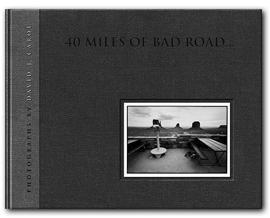 There is a limited edition of 40 Miles of Bad Road that is signed and numbered by the photographer. This edition is limited and includes an 8″x10″ signed, captioned, and numbered print from the book. Please CONTACT THE PHOTOGRAPHER for information on availability and pricing. This book is is a collection of photographs taken throughout David Carol’s 25 year career. 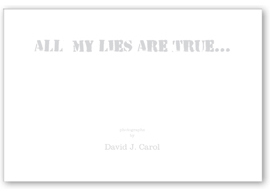 There is a limited edition of All My Lies Are True that is signed and numbered by the photographer. This edition is limited to 25 copies each of three different 11″x14″ signed, captioned and numbered prints from the book. It retails for $250.00, please contact the photographer for information on the very limited availability. This non-book contains 40 photographs and 14 accompanying text plates unbound in a clear Lucite enclosure with an essay by Jodi Peckman, Creative Director and Director of Photography at Rolling Stone Magazine.